Concept 2 Model E Rower With PM5 Review - A Pricier Model D? Concept 2 Model E Rower With PM5 Review - A Pricier Model D? Here we'll be taking a look at the Concept 2 Model E rower, which includes the upgraded PM5 monitor, and is supposedly one of the best rowing machines on the market. The Model E certainly looks professional and well built, and is often used in professional gyms with the general reputation that it's THE rowing machine to get if you want the best of the best. Whether or not you're a professional athlete, gym owner or just a “lay user” like myself, who wants the best equipment to use whilst working out, the questions we'll be looking at here on this page are just as relevant all the same. With the higher price tag than many other rowers on the market, including other cheaper models from the same company, does the Model E really live up to the hype, and is it worth the extra cost? These are the common concerns for most people interested in this particular rowing machine, but a little unsure, and what we'll be aiming to answer in this review of this model from Concept2. For those who don't have time to read the full review, feel free to bookmark us for later use, and check the current price for the Concept2 Model E on Amazon here. Are There Any Problems With This Model? The Concept2 Model E is often referred to as one of, if not THE premium rowing machine. With the great reputation of Concept2 already behind it, and being marketed as their best rower, along with that comes it's much more expensive price tag. There are several reasons why this model of rower is more expensive than pretty much everything out there. If you could sum up exactly what makes this model so much more expensive, you'd probably have to say something like, the professional build quality + high level features offering the best that the industry has right now + solid durability make the Model E very hard to beat. 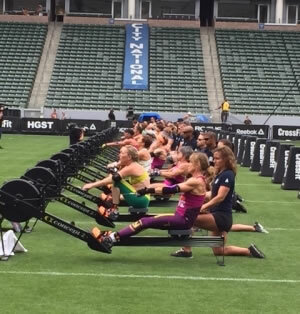 “A picture is worth a thousand words” as the saying goes, and this promo image from the Concept2 manufacturer's site, shows a bunch of their Model Es in a row being used by professional athletes in 2015's cross-fit games. Of course, this is just an example, anyone who's familiar with the Model E is aware that it's used in all sorts of professional arenas all the time. This is one of the reasons that this particular model is so often chosen in professional settings. It's built to last a long time (possibly forever? ), and can withstand pretty much anything whilst allowing for training in all sorts of forms. 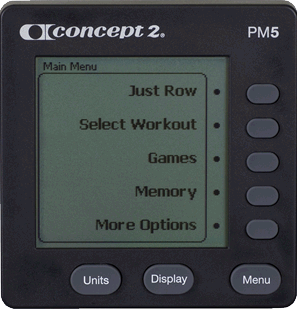 Especially when you consider all the options that the included PM5 computer monitor offers for training, and making your training programs more enjoyable and motivational, there's really not much that this rower won't do, well as far as rowing machines go. Max User Weight: 500 pounds (227 kg) as tested by Concept2. OR 300 pounds (135 kg) as tested per the European Stationary Fitness Equipment Testing Standard EN 20957-7. The new upgraded PM5 computer monitor that comes standard with the Model E is about as good as it gets when it comes to onboard rowing machine monitors, and you want find anything else on the market that's quite this well designed, well built, and feature rich. The PM5 is very feature rich, as you can see quite easily just from glancing at the main menu to the right here. 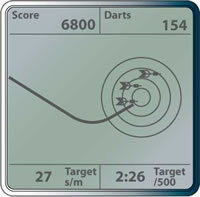 Concept2 have designed it to be easy to use and durable, and it definitely meets those requirements. Let's break down some of the different things that you can do with the PM5, and discuss some of the available features and options for training that it provides you. This is basically if you just want to launch into a session without any specific training parameters, or without wanting to use a game, etc to help your session. This is where you're able to select from a plethora of different workout options. There are a total of 4 different game choices that the PM5 offers to help inspire and focus you during your training sessions. 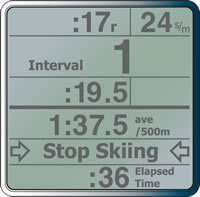 Using freely available software from Concept2, the PM5 allows you to store your sessions to a USB flash disk/drive, so that you can then later upload your personal session data to your online logbook or transfer the data to a PC or Mac computer. This feature allows for a lot of convenience, and offers users the additional handy option of transferring their favourite custom training sessions between different Model E rowing machines if desired. Just be aware when using the USB transfer to computer feature, that this particular ability is only compatible with FAT and FAT32 USB formats. One of the tell tale signs of high quality for any piece of workout equipment is its level of build quality. Is the unit made from high quality metal components? Are the seals and rubber components of high quality materials? All of these so called “smaller” components need to be not only made from high quality materials, but the machine's design itself needs to be of an excellent standard if you're going to end up with an product of the kind of quality you'd expect at this price point. The Model E, like it's little brother (or sister) models is designed superbly, and made from highly durable materials and parts. This is probably a large factor in the excellent reputation that Concept2 have developed for their products over the years, so you'll be hard pressed to find fault with the build quality here. Being an air pressure based system, having the ability to change the level of resistance given when using the rower is of vital importance, and to address this the Model E offers 10 different modes of operation or “damper levels” which you can choose from. Generally speaking, it's recommended by Concept2 to use a Damper setting of somewhere between 3 – 5 for a great cardio workout. But this of course is an area that's highly subjective, and will depend on your level of fitness, how often you train, etc. Ultimately you'll want to play around with this setting, until you find the right level of resistance for your preferred difficulty of training. 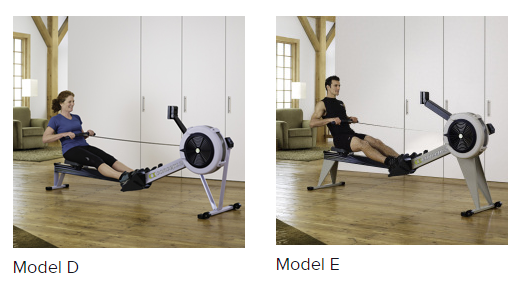 This is one of the most visually distinctive features of the Model E compared with many other rowing machines, including the Model D rower from the same manufacturer, and is one of the main reasons, if not THE main reason that people are willing to spend the extra money to get this model. The Model E sits noticeably higher than the Model D, and this is said to be a much more convenient and comfortable height to work from, and is especially noticeable when you're exiting the seat after a session, which is when your knees and other joints are most likely to already be a little inflamed from a hard workout. The Model D from Concept2 sits at 14 inches (36 centimeters) whereas the Model E is much higher, sitting at a height of 20 inches (or 51 centimeters). You can easily see the difference from the image below, which shows the seat height comparison quite well. Although the overall size of the Model E is not exactly small (how are you going to avoid this, when designing a professional rowing machine though?) it's partially made up for by the excellent storage design that is incorporated by the Model E, allowing you to fold the unit up for much easier storage in your cupboard, basement, etc. You can see here the HUGE difference in space required when the unit is folded up, compared to when it's fully extended for a workout. Whilst some customers have complained it's not “that easy” to fold up, it's a pretty intuitive design and is definitely a useful feature worth mentioning for those who need the extra space when they're not using the rowing machine. If you look at the reviews and customer feedback you will quickly see that most people who have purchased the Model E are extremely positive about both their buying, and ongoing experience with the product. It's a quality machine, and that shows in the reviews. The main common feedback from customers who bought the Model E, is that it's very well built, and they really appreciate the seat height being at the 20 inch level. It's said to be MUCH more comfortable than other rowers simply because of this design distinction. Of course there's always minor grips and “cons” that people come up with, like it's too loud, etc. A lot of such feedback for this product is quite subjective though, and it's tough to see any really obvious patterns of severe issues with the Model E based on reading the online feedback and reviews. Are There Any Problems With This Rower? Obviously no product is absolutely perfect to absolutely everyone, it's simply not possible. So let's have a look at the negative feedback out there for the Model E.
Firstly, it's too damn expensive for the “minor” difference of just having a higher seat is probably the main complaint you'll hear from either users who bought the Model D, or bought the Model E and then later thought they'd made a bad choice. If you're REALLY tall, like over 6″ 4′, then this rowing machine might not be the best for you, and you might actually be better off going with the lower, but slightly cheaper model, the Model D, which you can see the current price for on Amazon.com here. I'm struggling to find things to fill up this section with to be honest, because those are the main gripes that people have with this rowing machine. The design quality and build are excellent, and the PM5 leaves nothing really to be desired (unless you're expecting more advanced games on a rowing machine, to keep you entertained – which is really just something that's still developing within the industry and not a reflection of a poor quality product attribute for this particular model). If you're in the mind to purchase the Model E then you basically have 2 options. First option is to seek a local sports store type seller who either has the Model E in stock, or can order it in for you. If the price is competitive then this may be a good option, as it's always nice to have the support of a local seller should something go wrong, and to add to that, I do like to support local business as much as possible, when it makes sense from an intelligent buyer's perspective. That being said, In most cases, at least from my experience, those are about the only advantages of ordering something locally. Quite often you can find better pricing online, and whilst you don't have the local face to face support, if you choose a trustworthy supplier such as Amazon, then you're in safe hands as far as your transaction goes, warranty, etc. So there are a bunch of options as per usual when it comes to purchasing online. I think Amazon is the best choice based on the fact that you get their amazing support, trust. Sometimes this particular product will come with free shipping, though I can't claim that here on this site, but you can check below. Is it better to buy from Concept2 Directly or Amazon? Both options are good, though some customers have commented that they may have been able to save money on shipping costs if they had gone through Amazon whilst being members of the Amazon Prime programme. (As of the time of writing of this page, Amazon.com provides free shipping included when you buy the Model E via their site. You can check the current price here). Is there a community for Concept2 customers to get support for using the product? Yes there is indeed! There is a great online community here, and you can see all things Concept2 rowing machine specific here. Are there any good games on the PM5 computer for the Model E? 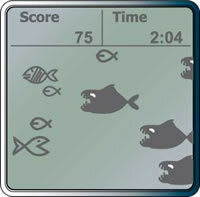 Yes, we've looked at the games briefly here on this page. Where is the concept 2 rower made? Firstly, the Concept2 company is based in Vermont, USA. As far as where the machines are manufactured, from researching this online, and finding feedback in the Concept2 user community, it seems that the main frame of the Model D, Model E, etc is still made locally, but many if not most of the smaller parts are sourced from different parts of Asia. That's as specific a details as we could currently find. If you wanted a more definitive answer, you could try calling Concept2. Where can I buy a Concept2 rowing machine? Well you have a bunch of different options. You can either find a local sports shop or similar that will order your desired machine in, and usually depending on how big the store is, you'll have to pay some kind of deposit down before they will order a relatively high priced item in for you. The other popular alternative option is to use an online supplier like Amazon.com or similar. You can find the Model E here on amazon.com. Which Concept 2 rower should I get for crossfit training? If you are training for crossfit, then you are probably an intermediate to advanced level athlete. If this is the case, based on the demands that you'll require from your rowing machine, I would recommend the Model E if you can afford it. The Model D may also be a good option, but the Model E is really the best rower that you can buy (at least in terms of an air resistance based model, there are other models that use water resistance that are more expensive), and it's priced higher than everything else for a reason. 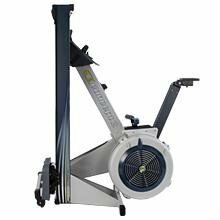 Which concept 2 rower should i buy? Well of course this will really depend on several factors that are specific to your situation. For example, your budget and your training requirements, and the level of intensity of the training that you'll be doing. For people who want a seriously good rower, depending on budget and other things including what we just mentioned above, the Model D or Model E are good choices. How long is the concept 2 rower? Presuming we were talking about the Model E, it's just over 8 feet, or 96 inches (244 cm). You can see all the basic specs for the Model E (the obvious focus of this page). The Model D is also the same length and is worth mentioning here for convenience sake. How do I assemble my Model E rowing machine? There's details on the Concept2 website, and here's the video they provide that shows how the assembly process works, it's pretty easy if you just follow that. The Concept2 support receives great feedback from current and past customers too, so if you run into any issues, you can always just call them directly. How to service the concept 2 rower? Bare in mind before reading any further, we have to presume this question is being asked for someone wanting to know about the Model E, as it's impossible to give any sort of information if we don't know what rower make/model, as all information on this specific question is going to of course be model specific. Firstly, it should be noted that you'll always want to try and have the perspective that you're going to attempt to maintain your Concept2 rower as best as possible. This will ensure that your machine doesn't develop any serious issues from not being well looked after. It's just the same as looking after your car (or bicycle, if you don't drive). Most maintenance can be carried out quite easily yourself, and you can find all the information about how to maintain your Model E rowing machine here: http://www.concept2.com.au/service/indoor-rowers/model-e/maintenance (this is the .com.au – Australian – version of the website, but you can find all the same information on concept2.com as well here). If you're actually at the point where you want to get your Concept2 rower serviced by a professional, there are dedicated professional companies setup for this very purpose, some of which do both domestic and commercial servicing for gym equipment. I suggest Googling online a bit for this, to find something that works for your local area. For example, in my location in Australia, a quick Google search for “domestic rowing machine repair” and I was able to find this particular Australia based gym equipment servicing company. How can I repair my concept 2 rower? Pretty much just answered this question in the latter part of the answer to the above question, so please check that. A bit of online researching should help you a lot, and if that doesn't turn in any results, I would suggest calling Concept2 directly for ideas. Their contact details are found here. Again though, if you're following their recommended regular maintenance routine, you should be able to avoid most issues, of course apart from if something directly damages the machine, which is outside your control. How do I calibrate the concept 2 rower? It's a little hard to answer this question based on the fact that you could be referring either to the calibration of the monitor, or the calibration of the damper, to set how much resistance you experience when using the machine. The calibration of the damper is pretty straight forward, as you basically just select a setting from 1-10 based on how much resistance you want to experience whilst training. As far as the monitor goes, assuming that it's the same as earlier and less advanced models, such as the P3 and P4, the PM5 is self calibrating. This means that you shouldn't ever have to calibrate it yourself. If you do need to for some reason, I suggest being very careful, and contacting Concept2 beforehand, so you don't make anything more complicated than it needs to be. How does one disassemble a concept 2 rower? If you basically reverse the process of assembly, you should find it pretty easy. You can find more specific details on the assembly/disassembly process on the manufacturers website right here. How do I maintain my concept 2 rower? How loud is the Concept 2 Model E rower? This is a bit of a hard question to answer based on its subjective nature. What is loud for a rowing machine for some, maybe relatively quiet to others. If you're used to something that's not using air resistance like the Model E, such as the rowing machines that use water to create resistance, then you may find the Concept2 rower fairly loud, but that's because the air resistance system for rowing machines is just generally louder. If you really want to answer this question for yourself personally, then your best move would be to actually see each type of rowing machine (water and air resistance) side by side “in person”, so you can listen to the difference. How do I reset the Concept2 Model E rower? Firstly, this is presuming you are actually referring to how to reset (factory reset) the PM5 monitor itself, as there's no way to really “reset” the whole rower itself, you simply adjust seat positioning, damper resistance settings, etc as you need to. In order to perform a factory reset of the Concept2 PM5 computer, all you do is simultaneously hold down the unit and display buttons, whilst using a paperclip or similar in order to press in and release the reset button, which is found on the back of the monitor. If you continue to hold all of these buttons in combination for 7 seconds or more, the unit should do a factory reset and be restored to it's original settings. How do I clean the concept 2 rower? It's part of the general maintenance scheme, and therefore you can find details on how to that above here, in another question already addressed about maintenance. How do I fold the concept 2 rower for storage? It's fairly simple, and although the directions in the manual (found here) are not overly detailed, as long as you are careful and take your time so as to avoid accidentally hurting yourself during the folding process, you shouldn't find it difficult. How do I use my Concept2 rower? It's fairly self explanatory, and a little like riding a bike, to explain this in words would be slightly difficult and a little meaningless as it's an experiential process. Basically as you use the rower, you'll become more familiar and adept at it. Yes, there are options for those who find the seat too uncomfortable. For example, you can get seat covers that are universal and fit most rowers, such as this seat cover here (AMZN link). There's also similar products available on the concept2 website itself here. However for most users, they will find that pain from sitting too long on the rower only happens on marathon or extra long sessions, like 45 mins – 1 hour or more. So you can simply avoid doing longer sessions, unless you're training as a professional triathlete or athlete, for which the seat padding might be a good thing to look into. What's the assembly difficulty like for the Model E? It's said by many customers to be pretty easy, with only 10 screws to adjust, and 2 main parts to piece together. The instructions are also said to be good enough to make assembly easy for most people. If you're not very “handy” with such things, then it might be helpful to have someone around when you plan on receiving the product to help you put it together, especially if you have back or other bodily issues you want to be careful of. For those of us with back problems, will this machine cause problems? Firstly, always seek your Doctor's advice before doing anything that you're concerned might be a risk to your health, this is of course common sense. Having said that, most anecdotal evidence suggests that as long as you adhere to the correct use and bodily position while using the machine, then you should be fine. Some people reported that it actually helped to give them some mild form of improvement in lower back strength and conditioning, and others have said that it actually loosened up their back quite a bit, but that doesn't mean everyone will necessarily get these types of benefits. Apart from getting your Doctor's advice, just use your own common sense and caution when starting a new exercise form. Is using a Concept2 (or any) rower mainly for cardio workouts, or upper body, etc? Actually using a rower such as this is a full body workout, and you'll get a good burn in your legs too as long as you're at least slightly pushing yourself during your workouts, as many customers have reported. Is the Model E okay to be used on carpet, or hardwood floors, etc? The frame and design is pretty solid, and almost all users who have mentioned this aspect say it's a non issue, regardless of the type of flooring you're using the machine on (obviously it needs to be level, outside on the grass might not be ideal). Can the resistance (damper level) be adjusted? Yes, the damper level has 10 different settings. From 1-10. Damper level 3-5 is the general recommended resistance setting for most people, but this is highly dependent on how you're using it, you're fitness level, etc. How many boxes does it come in when being delivered? In most cases, when ordering from Amazon.com at any rate, it comes in 1 large box upon delivery. According to some users, within the large box is 2 smaller boxes, and this would make sense, as on the manufacturers website, it does indeed state that it's shipped in 2 boxes in the product specs information. What about if I have big feet, will the Model E accommodate for my size? Again, this is really a subjective question, what's big in your books? That being said, users have said that even people with size 17 (presumably US shoe size) can use the Model E without any issues. Other users have said that up to 8 inch (length?) of shoe size should be fine, but larger than that maybe not. If you're really concerned about this, then this is a perfect example of when you might need to at least see the machine in person before buying, even if you do decide to purchase online to save money later on. What are the dimensions as far as the shipped boxes, etc when getting delivered? Does the Model E have velcro or proper foot straps. Proper foot straps, made from rubber/plastic. This strap is designed with rubber like teeth, which click into place. Are there any programmes built into the PM5 computer which gradually raise intensity/resistance? Because the resistance level is really only controlled by a) the damper, and b) your own effort, it doesn't really work this way, and the only way you could create “gradually increasing resistance” is to start off easier and then gradually increase the amount of effort you're applying. Could you use a backrest with this? Seeing as there is constant movement from the user in the rowing machine, which changes the arch of the back, it's unlikely this would really work. What's the specific Db (noise level) from the Model E? Currently this specific information is not available, but most users report that they think the machine is either really quiet, or relatively quiet (a conversation may be had whilst next to it when in use). How do you oil the chain on the Concept2 Model E or D? Seeing as the chain is attached to the handle which you pull during a workout, all you do is wipe the chain with oil from a paper towel, rag or similar while you're working the machine. What's this model like for folding and storage? It does come apart, and fold which is great for storage. That being said, it's not super easy, as you have to take do some minor disassembly. However customers have commented that this is beneficial if they are more restricted on space, and have guests they need to accommodate for in the spare bedroom, etc. I am 6″4′, will I be too big and come too close to hitting the monitor? Other users who are this size have reported that the Model E is just fine, but any taller and you may want to go with the Model D, as it's a little more flexible in terms of moving the monitor arm. Correct posture while rowing is also said to be pretty important for when it comes to taller users not hitting the monitor. Is there a warranty that comes with the Concep2 Model E? Yes, of course. 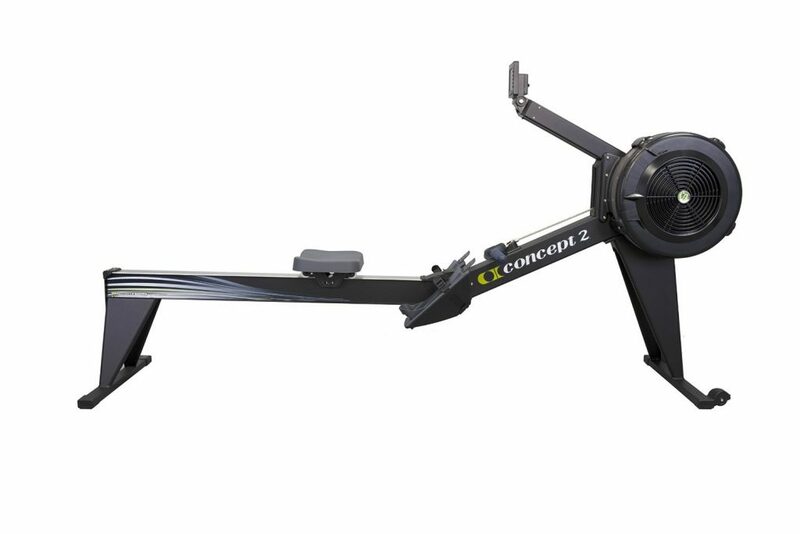 As per concept2's website “Concept2 Model D and Model E Indoor Rowers are backed by a limited 2-year and 5-year warranty. You can find out more specific details in their PDF dedicated to warranty information, which can be found here. Also, most users have commented on how well built this product is, and the manufacturer state that they have built it in order to be very easy for the home user to maintain and repair if necessary. What's the main differences between the Model E and Model D apart from price? The main difference is the height. The Model E just sits much higher off the ground. If you want a comfortable machine, then the height difference is HUGE. It will depend on your needs, and relatively how much more you are willing to pay for that extra comfort. With that being said, let's get onto the big question that everyone's asking, is the Model E worth it?? Conclusion – Is The Concept2 Model E Really Worth The Price? Well as you can see, on this page we've taken a really good closer look at everything about the Model E rower from Concept2. When it comes down to it, if you're looking for the absolute superstar, best of the best rower, and best machine that your hard earned money can buy, then the Model E is probably the indeed the correct choice, and you should probably go here now to lock in getting the superior model. However with the main difference between the model E and it's little brother the Model D being the seat height, for those people looking for a great quality rowing machine, but still wanting to save as much money as possible and not too concerned about having to train a bit closer to the floor then the Model D may be a better option. Check to see the current price for the Model D on Amazon. Product Description: The Model E is the premium rowing machine from Concept2. It comes laiden with rich features, that are enough to keep any avid fitness junky happy for a long time. If you want top of the range, then this is the choice for you.